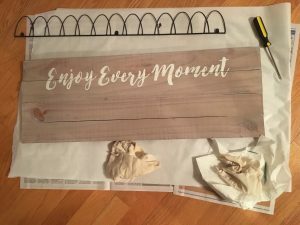 I found this cute little sign that is perfect for my command center – above the weekly calendar. 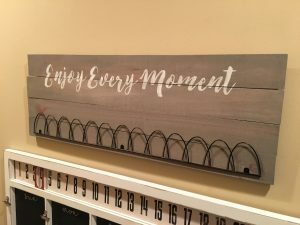 I love this piece, and it’s placement, because we should all try to remember to enjoy every moment of everyday – not just the big moments or the big days! What I didn’t love was the orange-y color of the piece. To fit with my other items in the command center, I wanted to get rid of the orange and end up with a more modern farmhouse look of aged gray. To achieve the look I wanted, I used a two-step process. Be sure to shake your pickling wash before you begin. While the results of a pickling wash look like it would be a difficult process, it’s really quite simple. After shaking the jar of wash, use a brush to quickly apply a thin coat to the entire surface. Wait about 30 seconds. Then wipe the freshly painted surface with a soft cloth. 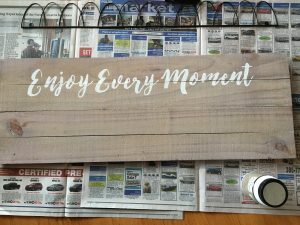 To achieve the results I desired, I waited overnight for the wash to dry then I used a second coat of pickling wash, this time in Driftwood. 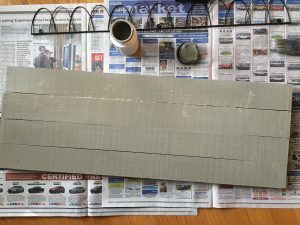 Had I been trying to achieve a more uniform look, I would have lightly sanded the surface before I applied the first pickling wash. 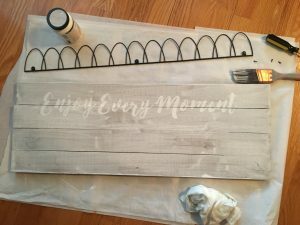 I was going for a weathered look, and I wanted the imperfections to show so I was able to skip the sanding. I’m so happy with my final product and it now fits in perfectly with the other elements of my command center.